It can be inherited but is also triggered by injuries to the eye or inflammation. Ageing is also a major risk factor. Regular checks are crucial to detect it, and patients are usually given drops to help excess fluid drain away, or, in more severe cases, laser surgery to increase the drainage of fluid. But many patients often forget to put their drops in at the right time, or put too little in. Missing drops regularly, or even just delaying them, can increase the risk of glaucoma getting worse. Meanwhile, laser surgery is a fairly complex procedure not always suitable for patients, so the i-Stent could provide a simple and permanent solution. It is normally carried out at the same time as patients have cataract surgery. Once doctors have anaesthetised the area, they make a tiny incision in one corner of the eye. 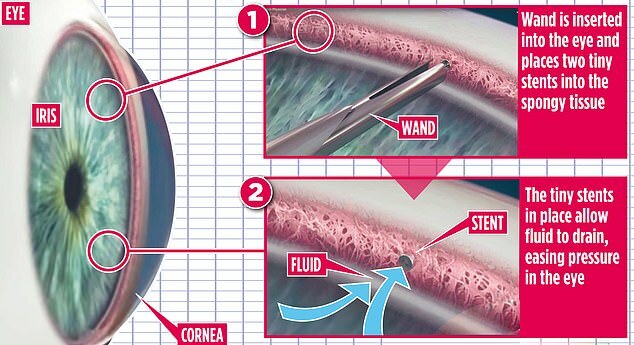 Using an ultra-thin needle, they then inject a miniature stent into the Schlemm’s canal – a tiny draining channel in the front of the eyeball. The process is repeated on the other side of the eye. 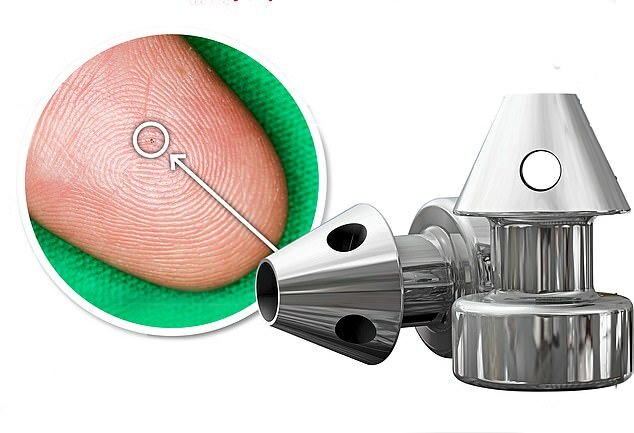 The implants are made from titanium, which is not rejected by the body’s defences. They remain in place permanently and are so small that patients are unable to feel them in their eyes. Ms Nagar says although the implant is not guaranteed to work, success rates so far are fairly impressive. ‘Some patients never need drops again, and others can significantly reduce the amount they need,’ she adds. Retired engineer Ronald Bretherton, from Wakefield, was one of the first glaucoma patients in the UK to receive the miniature stent. Doctors had warned Ronald, 88, his glaucoma was no longer responding to drops to reduce intraocular pressure. He says: ‘I was diagnosed with glaucoma nearly 20 years ago and had been putting in drops twice a day. ‘But when doctors said my pressure readings were rising and the drops were no longer working, I knew there was a risk I could go blind.